The monstrous success of Jurassic World, so many years after the first book hit the shelves back in 1991, made me wonder why Jurassic Park worked then and still works today. Michael Crichton, the author of the two Jurassic Park novels, knew how to write a riveting thriller with science at it’s center. He’s done it time and again. Man versus monster is a tried and true theme. But buried deeper in this story is this question: is humanity destined to cause its own downfall? If our drive to know how the universe works reveals that we can do something, will we be compelled to bring that something into reality? Genetic modification of plants and animals for short term gain? Check and check. It’s a universal theme. The Bronze Age Greeks asked the same thing in their stories. They called it hubris. Arrogance before the gods. But there are plenty of books with similar themes that never took off like Jurassic Park. But then Crichton was more than just an idea man. He was a quality craftsman. He gave us page turners while all the while teaching us something about the dangers blocking the path toward a healthy future for humanity. And at the heart, in Jurassic Park he gave us a handful of people in conflict with each other as they navigate external strife with monsters. Some critics of his work say his characters are made of cardboard. They accuse him of writing people who are little more than archetypes. Maybe this is true. But critics are paid to find elements to critique. I think the readers are better suited to gauge the resonance of a work. And readers voraciously devoured his books throughout his career. 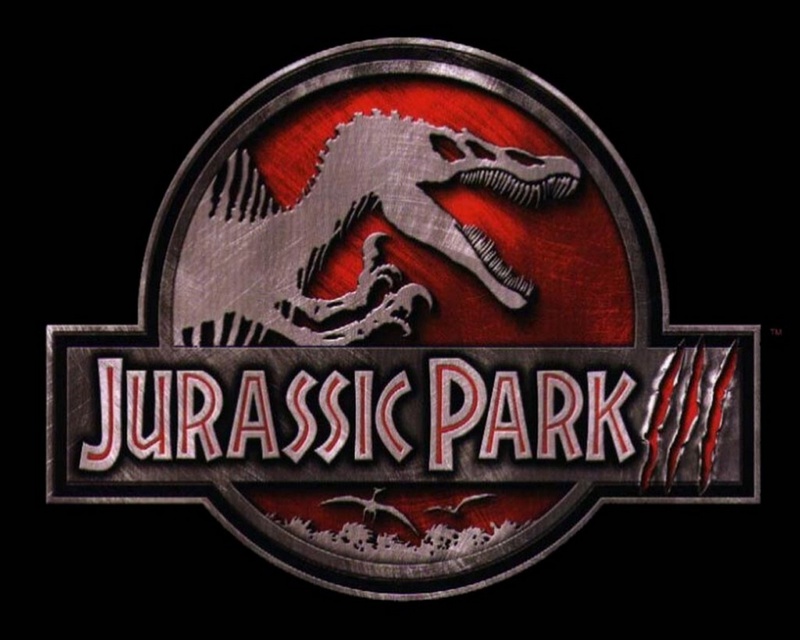 Michael Crichton co-wrote the screenplay for Jurassic Park with David Koepp. It comes as no surprise that the major beats of the film align with the spine of the book, though changes were naturally made. As a respected film director and TV show creator in his own right, Michael Crichton was intimately familiar with the differences between print and visual media. Many novelists without a screenwriting background have been beaten down by the medium. 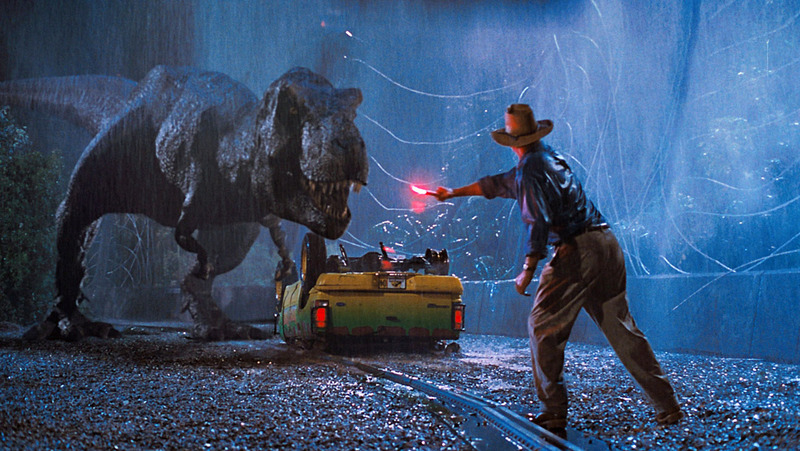 I think the first Jurassic Park film hit such a deep chord with audiences in part because Spielberg assembled such a spectacular team, including the author of the original story. Worldwide the movie has earned $1,029,153,882. That’s over a billion dollars. And it cost $63 million to make. I hope Michael Crichton and his heirs got a sizable cut of the revenue. Movies rarely match the books which gave them life. There are many good reasons for this. Imagine trying to mash a five hundred page book (with dense text and lots of exposition) into a one hundred and twenty page screenplay. Many things have got to go. Big tech-laden monologues must be jettisoned. Globe trotting thrillers have so many damn characters and locations. How can a movie going audience keep them all straight? A reader can set a book down and take time to mull over what just happened. You can go back twenty pages to remind yourself who did what to whom. A movie reel just keeps rolling along until you reach the credits. Most books have to be cut down to size to fit into a standard time slot in the theater. Three hour movies are rare, and even these can’t fit in every twist and turn of most novels. But in The Lost World, Spielberg made an odd choice; he decided to go with more story, not less. Perhaps he thought the setup and payoff were too similar to the first book. 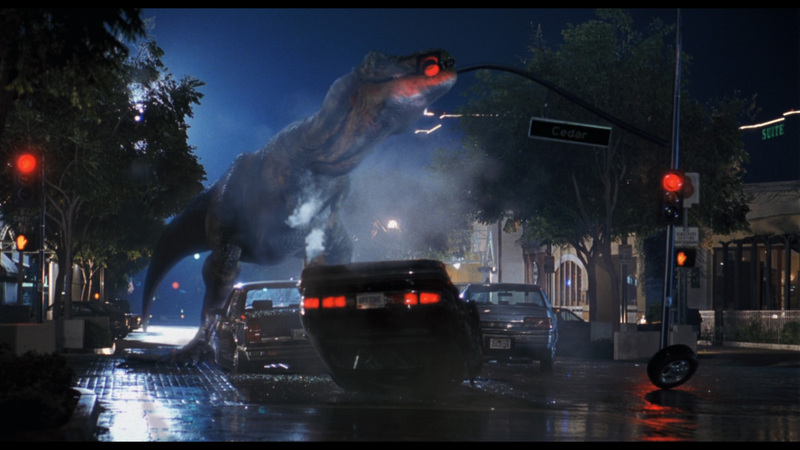 It’s also possible that the filmmakers said, “We can’t have two movies where everything happens on an island.” Other rumors suggest Spielberg wanted to direct a Tyrannosaurus Rex rampaging an American city, and although he thought that would best be explored in a third film, he decided to jam it in because he never expected to direct the third film in the franchise. Hopefully that story of Spielberg’s boyish wish fulfillment was untrue. I’ve recently read Jaws and re-watched the film. Spielberg improved on the book rather impressively in that instance. And there were extensive cuts. Furthermore, there’s often a magic in a first book (or film) that can’t be replicated in the followup story. I think it’s because in a first book we are exploring the unknown. The world setup is unique and fresh. Was Jaws II anything close to as good as the original? Before Jurassic Park, can you remember another dinosaur story other than those early 70’s cavemen films with stop motion Pterodactyls? The antagonists of the first book — the rival company wanting to steal In-Gen’s proprietary technology — are also the antagonists in The Lost World. BioSyn’s rep Dodgson is out to steal eggs and baby dinosaurs again. In the film, they’ve instead gone for internal strife. Hammond wants to send in a research team to observe how the dinosaurs on island B have survived without human intervention. Hammond’s nephew, in a bid to take over In-Gen, heads to the island with a massive team to capture dinosaurs for a zoo in San Diego. Why this change? The outward elements are the same. Bad men want to take dinosaurs off the island. In the book there are two sets of people we have to follow in parallel lines. That is hard to pull off in a film. 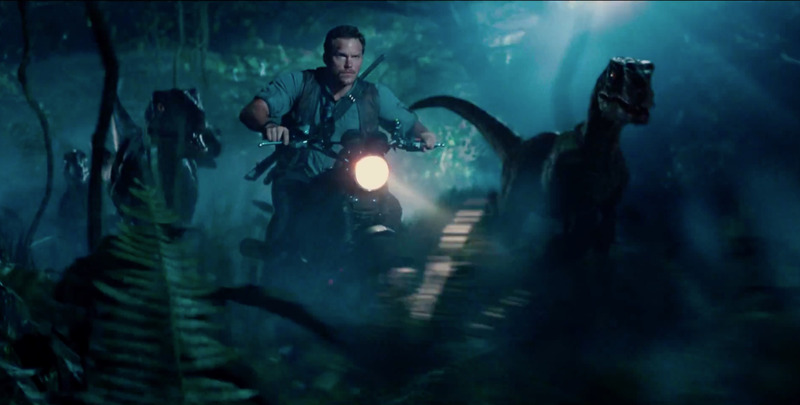 In the movie, once the dinosaurs get the upper hand, the two teams must quickly join forces to get out alive. That’s a clever way to tighten a broad story. In both the book and film, a Tyrannosaur baby is a key ingredient. A stow away child increases the stakes. The villain meets his demise at the mouth of the baby dinosaur he covets. More often than not the filmmakers went for one liners over realism or consistency. I won’t argue that a little levity can do wonders to relieve tension. But one of the strongest through lines of the book got stripped away, and the film is so much weaker for it. Crichton’s Lost World gave us a female hero. Dr. Sarah Harding’s intelligence and bravery saved the day again and again. Where the men gave up, she forged ahead. And what’s more, she acted as a strong role model for the girl who questioned her own worthiness and capability. Kelli, the girl, did have a moment of triumph in the movie, but sadly she defeated the physical threat with physicality instead of her critical thinking. She employed her double bar gymnastic routine which failed to win her a spot on the squad back home. Dr. Sarah Harding’s exuberance and curiosity in the film undermined her status as THE authority in carnivore behavior. She kept wearing her jacket which was covered in baby tyrannosaur blood, yet the animal was supposed to have a sense of smell more powerful than a turkey vulture, as she herself admonished another character a few scenes earlier. It made for a scary set piece, but Crichton didn’t write these sorts of inconsistencies. Gone is the primacy of scientific knowledge and ingenuity. David Koepp, the screenwriter, must have been asked to simplify the story. I say he dumbed it down and reinforced negative stereotypes, while adding undue complexity in the form of a hundred “red shirt” extras that offered visual opportunities for carnage and mayhem. But if I don’t know a character’s name, I really don’t care how he gets eaten by a pack of velociraptors. Spectacle so often dissipates the moment the lights come up in the theater. And still, versus its production budget of $73 million, the movie has earned $618 million worldwide. No wonder they keep making them. With the next installment, the number of (credited) writers increased to three. It’s my opinion that the longer the list of screenwriters, the more the producers are working from a place of fear. And when fear takes over the storytelling, you get bland, tired tropes. You get set pieces that work by themselves, but fail to follow through down the storyline. Playing it safe increasingly means leaning on spectacle and forgetting about plausibility. In flawed movies like this I am often more impressed by the actors (good actors in bad movies). I readily admit I’ve acted in poorly written and directed films. I’ve had a tough time pulling off hammy lines and acting out terror when I knew the monster was just a man in a rubber suit. 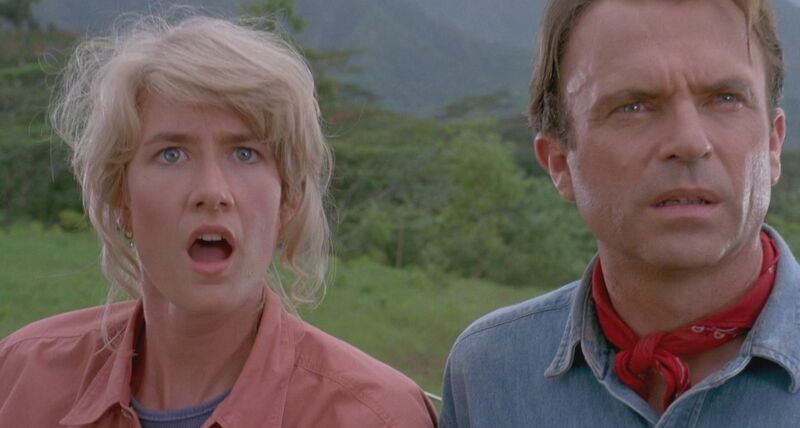 The Jurassic Park movies, however flawed, never miss the mark with casting. The studios hire consummate professionals who have extremely healthy imaginations and a willingness to take risks. But with each subsequent link in the franchise chain, we see fewer scenes which require emotional vulnerability and more that rely on visual effects. Crunch, stomp, destroy, explode, kill, and rampage. The external story: save some kids from man made dangers (dinosaurs). The internal story: Selling one’s ethical stance to fund good works. 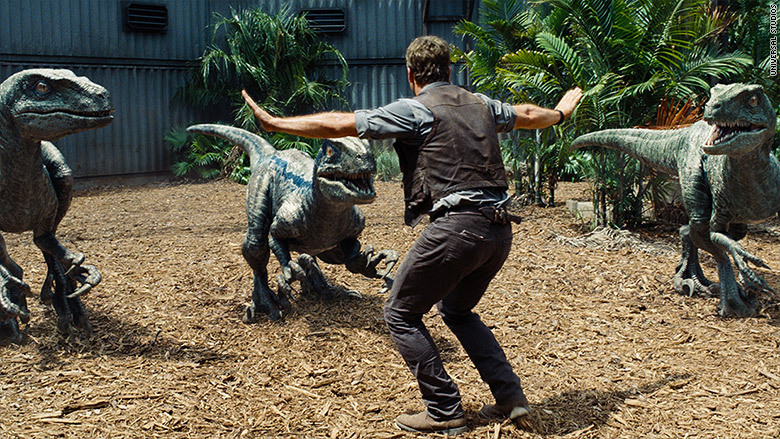 The hook: Dr. Grant’s latest theory is that velociraptors have the ability to communicate verbally with each other. More intelligent. More dangerous. The Fatal Flaw: taking eggs from the velociraptor’s nest. If this is starting to seem like a formula, don’t worry about second guessing yourself. Eggs and babies. It’s always eggs and babies. Michael Crichton stopped writing the book series after the second novel. He moved on to new ground. For him, the idea of dinosaurs being brought back by man had been explored thoroughly and completely. There are a lot of scientific discoveries out there making waves for our future. Why ride the same rollercoaster again and again? But increasingly the film industry relies on rehashing the same worlds. I can understand this stance. A book costs the time and energy of one person. A movie costs millions of dollars and the time and energy of hundreds of people. So an author naturally can afford to take bigger chances than a screenwriter for hire. Supposedly there was never a finished script for this film. The director Joe Johnston is quoted as saying, “We shot pages that eventually went into the final script but we didn’t have a document.” Imagine building a skyscraper without a blueprint or plans. And yet the movie pulled in $389 million worldwide. Compared to the first film, this was a flop. But taking the $93 million dollar budget into account, this film was still a resounding success. Why put that much more energy into making the story better when you get returns like that? ROI first, art second, is the business of making movies. Studio executives will make that choice all day long. I hate to admit it, but I might have too. Years have passed and Crichton’s ideas have once more been resurrected. Is there room for a fourth story in this world he created? Those Costa Rican islands aren’t very big after all. The studios, of course, say yes. They cite brand recognition and an excellent monetary track record. Star Wars is still a force to be reckoned with. Star Trek continues to travel to places where no one has gone before. So what do we find in Jurassic World? Hubris. Greed. Kids in danger. A lone voice of dissent that points out the dangers to which others are blind. (Why does it always have to be the male voice?) A love story subplot where opposites attract. All these we’ve seen before. This story does have some new ideas, though. Well, new to this franchise . Hammond’s dream has finally come to fruition. An island park is fully functional and running like clockwork. Like the successful Terminator 2, the devious monsters from the earlier stories are now on the side of the heroes, though it’s a shaky alliance. The big bad killing machines, the Tyrannosaurs, have been modified, upgraded, and given unnatural abilities, because the patrons are already bored by resurrected relics. They continuously demand the next big thing. In this sense, the whole of society is to blame, not just a few greedy directors of the board. And there are no eggs to steal this time. It’s 2015. One would hope that Michael Crichton’s vision of strong, intelligent women saving the day was commonplace. Alas, it’s not the norm. There are positive outliers, like The Hunger Games Trilogy books and films. But Dreamworks failed on this front yet again by playing it safe. Likely the producers cite their target demographic — 13 year old boys — as the reason why 95% of the characters of substance are male. I don’t buy it. Way back in 1977, Alien broke through that stereotype and gave us Ripley. She was smarter and stronger than her crew mates and the monster. And we all know how well the Alien series has fared. Several of Crichton’s books exhibit a female main character of integrity and brilliance. That’s the Jurassic film I want to see. The latest film cost twice as much to make as the others — $150 million — but in less than six months, Jurassic World has brought in $1,668,889,431. That’s $1.67 billion! So far, it’s the third highest grossing film of all time. Supposedly there is already a sequel to Jurassic World in the works, and with these numbers it’s no wonder. A story concept dreamed up way back in 1991 still has solid legs. In a world where technology advances exponentially, one would expect Michael Crichton’s science to be dry as fossilized dinosaur bones. That we are seeing just the opposite shows just how far ahead of the times his ideas have been. Sadly, our medical science hadn’t progressed fast enough to cure him of the cancer that took him from us way too early. There are new authors out there taking up his mantle. Markus Sakey’s Brilliance Trilogy is a great example. Andy Weir’s The Martian has shown us that stories with science at their core can launch into a bestselling orbit. In my small way, I hope to carry on in Michael Crichton’s tradition of exploring how science can both help and harm humanity. I’ve even tried my hand at putting a female heroine dead center of my novel The Distance Between and having her run circles around the men in the story. Humans explore. We create. We can’t help ourselves. What we choose to do with our creations is our daily choice for good or evil. I for one think those themes are worthy of further digging. ← PreviousMy New Thriller, THE DISTANCE BETWEEN, is live!